Dual Purpose Websites – How to create a branding site that sells. For some reason, many people think that “branded websites” won’t sell product or produce a steady stream of leads. And on the other hand, they don’t think “Ecommerce sites” will help their branding efforts. Well, here’s the good news: You really can have a branded website that converts well AND presents a strong brand message. But you’re going to have to go beyond the template driven who-what-when-and-where approach that’s so common these days. Here’s what you need to build a branded website that works on both levels: The 4 critical elements of website design and effective web development. A wordpress theme is not a concept. A new logo is not a concept. A photo of your product is not a concept. A photo of the exterior of your building is not a concept. See, a concept is an idea. A concept from the Mini USA website homepage. And isn’t that the job of your website? Make a great impression. Engage people. Impress them. Leave them wanting more. That’s marketing 101. If you have a concept behind your site all the other elements will come together seamlessly. The problem is, most website builders don’t have the creativity, or the sales skills or the knowledge of your market, or the necessary budget to actually develop a cohesive concept for your site. That’s just too much to ask of one person. They can’t do all that, and then write the code to boot. That’s like asking the architect of your new house to also pour the foundation, do the framing, the plumbing, the electrical and the heating system, all by himself. You need a team to do a good site. But let’s look at the other critical elements of web development, and then come back around to who’s going to do all these things. Click here. Read this. Watch this. Listen to this. Order that. Give the user something to do that leads them deeper into the site, and further along in the sales process. They will seldom behave how you want them to, but the alternative is a hodge-podge of pages and elements that lead nowhere. A good story is your best differentiating element. As the old saying goes, facts tell but stories sell. Narrative, characters and plot twists are universally appealing, and very few companies present compelling stories. So find an interesting way to tell your story. Maybe it’s animation, or video, or a prezi-style slide show, or even a game. A game can be a differentiating element as well as a concept. Can you transform your web experience into a relevant game? Would that be appropriate for your brand? Differentiating elements: Concept, photo, copy, call to action. Photography can also be a great differentiator. The human brain skips right over familiar images, so don’t settle for the $10 stock photos that everyone else in your category is using. Hire a pro and make your stuff look better. Sexier. More graphic. 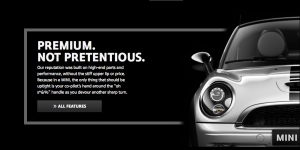 Copywriting can be the difference between a boring branded website and a lead-gen machine. Don’t let anyone convince you that great web copy is only about keywords, search engine optimization and factual “content.” Every sentence is an opportunity to stand out — or be thrown out. (One quick click and they’re gone to the next site.) Your copy should be sharply crafted. Persuasive. 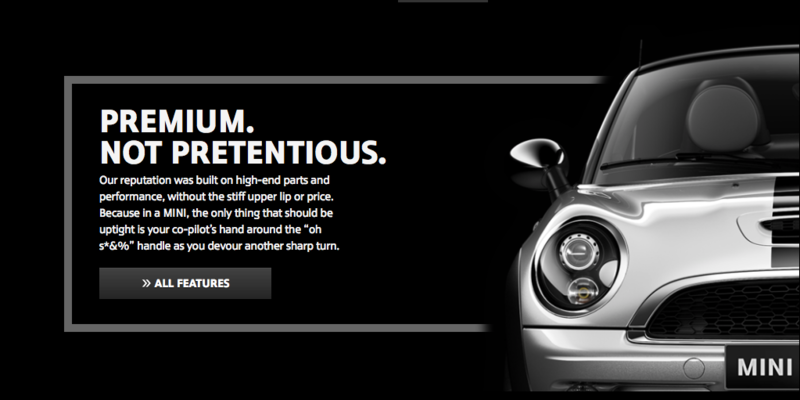 And convincingly genuine, so it doesn’t sound like any other brand. Here’s a test for you… pull up your branded website and the site of your biggest competitor. Side by side. Then imagine that the logos are swapped out. Are the sites interchangeable? The images the same? The copy comparable. Are you saying anything they cannot say? If not, you better go back to the drawing board and get a differentiating concept. Stories, concepts and images are important, but you also need some facts to back them up. That’s where some branded websites go wrong… they’re all fluff. You need proof that your brand delivers, as promised. For instance, post some testimonials or reviews from your happy customers. Release engineering data. Competitive reports. White papers. Market research. Anything that’s credible that backs up your value proposition. People make emotional decisions, but they often need facts to justify what they’ve already decided. So give them what they need, and do it in various forms on multiple pages. When they’re checking out, remind them that they’ve made a great decision. 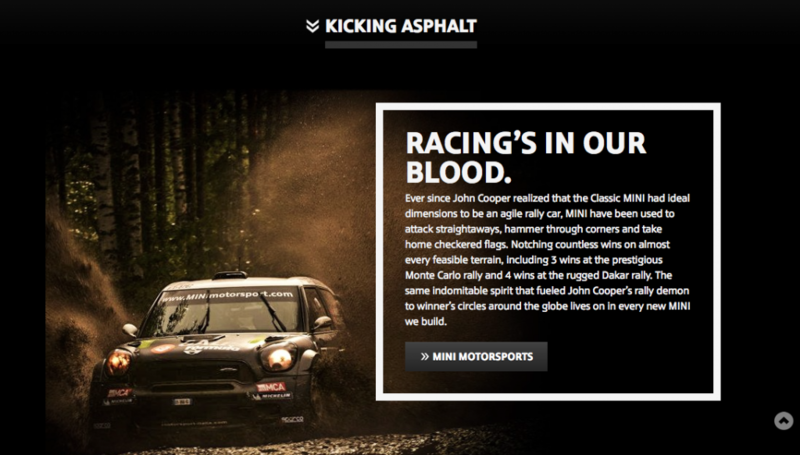 A very clear brand message… this is Mini Cooper in a nutshell. So this is all great, in theory. But how do you get it all done? Part of the problem is who’s doing the work… If your web developer doesn’t have anyone to collaborate with, you’re not going to get an big idea, or great imagery, or well-crafted copy. It might be great code and a functional site, but it’s not going to contain the five critical elements of effective website design. The team approach may cost a little more at first, but it’ll produce a better ROI. It’s cheaper in the long run because you won’t have to re-do your site 9 months later when it’s not performing as you had hoped. These days your site is a critical part of your business infrastructure. It’s your storefront and your main form of advertising. You can’t do without one, so you might was well invest in a website that builds your brand AND sells product. 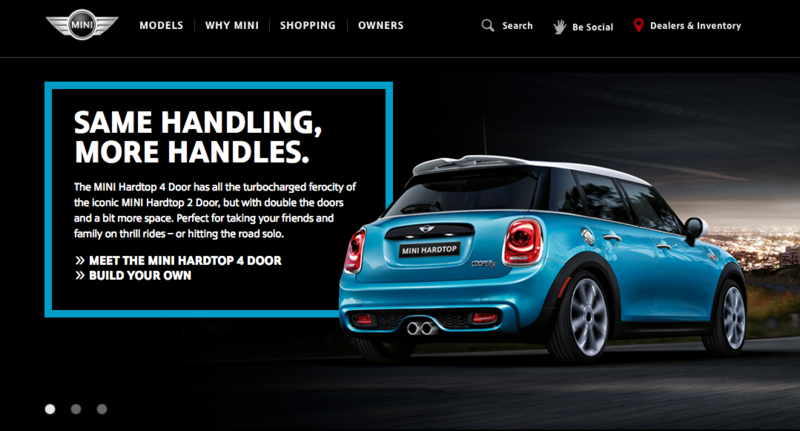 Note… this is NOT a paid post for Mini Cooper, just a nod to their agency and their web design team. This is great work. Plus, it’s a cool brand. For more about successful website design, try THIS post.